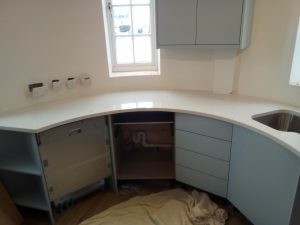 Another challenging installation under way! 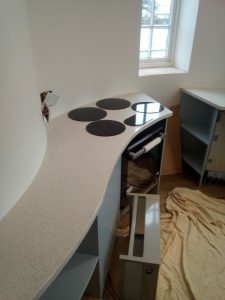 We are currently working on this beautiful curved kitchen in Milford-on-Sea. The cupboards have been bespokely made and sprayed in Farrow and Ball, Palma Grey. 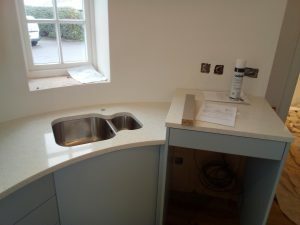 The stunning ‘Nougat’ curved worktops are by Caesarstone. Appliances are now being installated, including a Capel hob and Grundig, Divide and Cook Oven. 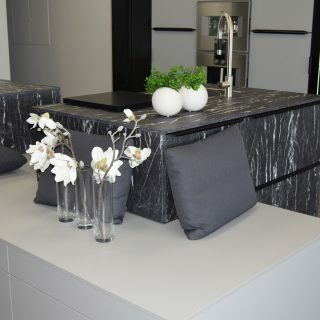 If you are looking for something a little different, why not call in and see us? 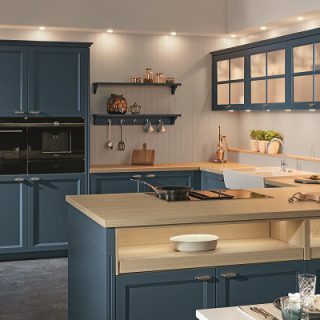 We offer fantastic flexibility and with our local workshop we are able to make bespoke elements (or full kitchens) to your exact requirements!